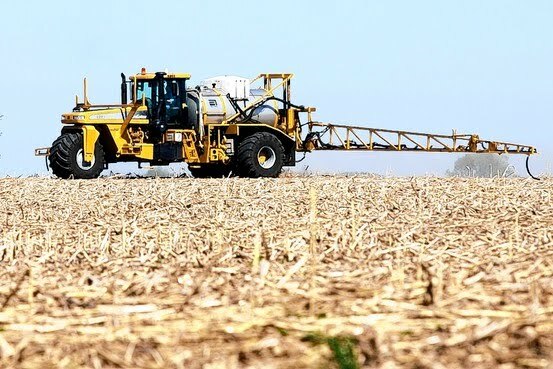 And big chemical companies—taking a page from Monsanto's book—are engineering crop varieties that will enable farmers to spray on the tough old weedkillers freely, instead of having to apply them surgically in order to spare crops. The bioengineering push is causing controversy, though. Some of the old pesticides—in particular, those called 2,4-D and dicamba—have a history of posing more risks for the environment than the chemical in Roundup. That's partly because they have more of a tendency to drift on the wind onto neighboring farms or wild vegetation. Roundup tends to adhere better to the ground. Some 40% of U.S. land planted to corn and soybeans is likely to harbor at least some Roundup-resistant superweeds by the middle of this decade, executives at DuPont estimate. That could create big demand for the herbicides that can kill the evolved weeds—and for the seeds of crops that permit free use of those herbicides. The burst of efforts by rivals isn't necessarily bad for Monsanto's crop-biotech business, at least in the short term. The chemical in Roundup remains able to kill hundreds of kinds of weeds and will remain a central part of the farmer's arsenal. Most companies developing crops tolerant of other herbicides want to build them on a Roundup Ready platform, so to speak—putting their new herbicide-tolerant genes into crops that already carry tolerance for Roundup. It was back in the 1990s that Monsanto upended the herbicide industry and farming practices by offering its first genetically modified product—soybean seeds into which scientists had transplanted genetic material from microorganisms and petunias. The seeds sprouted soybean plants that could survive exposure to Roundup. Chemically known as glyphosate, Roundup was known for its ability to kill almost anything green yet leave a relatively small environmental footprint, being less toxic to wildlife and people than most weedkillers. "If glyphosate isn't the safest herbicide, it is damn close," says Charles Benbrook, chief scientist of the Organic Center, a nonprofit organic advocacy group. The Natural Resources Defense Council petitioned the Environmental Protection Agency in 2008 to ban 2,4-D, citing research that suggests it disrupts hormones in trout, rodents and sheep. Dow says it is providing rebuttal data to the agency. A spokesman for the EPA said it anticipates responding to the petition this fall. Both 2,4-D and dicamba, another older herbicide, are common ingredients in weedkillers at lawn-and-garden stores, which homeowners are careful to keep away from flowers and vegetables. Chemical companies say both are safe in larger amounts if farmers follow usage instructions cleared years ago by the EPA. Bayer is developing soybeans that can survive exposure to a herbicide that disables weeds' defense to ultraviolet rays, setting them up for a fatal sunburn. Bayer hopes to have those soybean seeds on the market in 2015 and later give corn and cotton plants immunity to the same herbicide, called isoxaflutole. As for Monsanto, its chairman and chief executive, Hugh Grant, hinted in a call with analysts last week that the company is considering whether to begin selling farmers cheap, off-patent weedkillers that can kill Roundup-tolerant weeds. On Thursday a Monsanto spokeswoman, Kelli Powers, said, "We remain committed to working with farmers to manage weed resistance," adding, "We have a shared interest with farmers in continuing to deliver environmental and production benefits on the farm with glyphosate."